All_Your_Documents.rar Ransowmare is a sneaky computer infection that can give you the false hope that it can help you decrypt your files. Of course, the criminals behind this application could really be able to do that, but you can be sure that they will not do that for free. Unless you remove All_Your_Documents.rar Ransowmare from your system immediately, the program will continue to bully you, demanding that you pay the ransom fee for the decryption tool. You should never succumb to these demands because this way you would only help the criminals to reach their aims. Protect yourself and other user by standing up to this scam. When this program infects your system, it will try to tell you that you can unlock a specific .RAR folder that holds all of your personal files with a specific password. Only the ransomware can issue this supposed password, but that is just one of the ways the criminals could force users to pay the ransom fee. Not to mention that no one can guarantee the people behind this infection would really issue the password or the decryption key. Therefore, you will do yourself a favor by ignoring everything this infection tries to tell you. Our research team says that there could be a few distribution methods employed by this infection. The most popular ransomware distribution method is spam attachments that arrive with spam email messages. 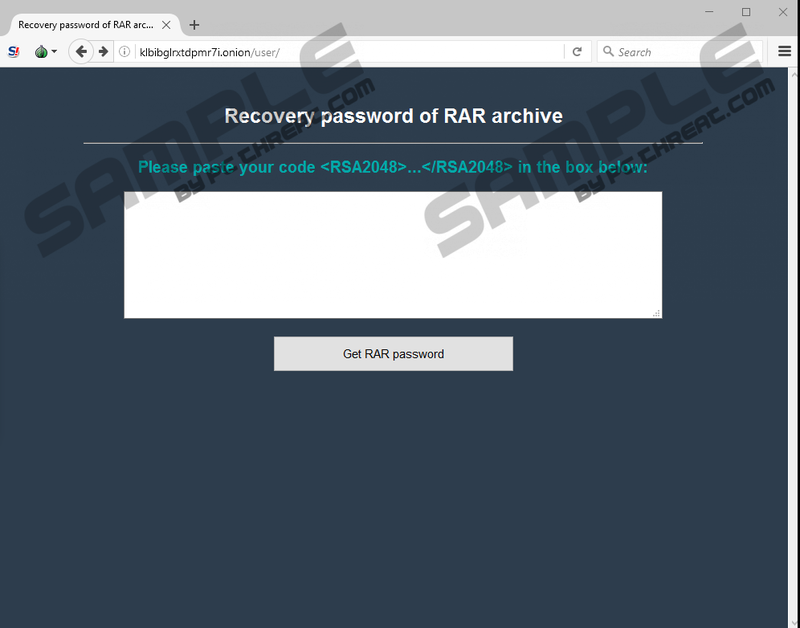 Users are convinced that the spam email message is something important, and they end up downloading and opening the attached file, subsequently launching the ransomware infection. Needless to say, it should not be hard to avoid such an infection if you were more careful about the emails you open, and the files you download. If you must, scan a newly downloaded file with a security application that will surely determine its purpose. Do not leave everything to chance and luck. It is not just spam emails that could deliver All_Your_Documents.rar Ransowmare to you. Sometimes malware could also travel via website exploits and even software bundles. This just proves that users have to be extremely careful when they browse the Internet because you can never know where the danger is hiding. It is also a good idea to acquire a security tool that would help you protect your system from malicious exploitations. It is especially relevant if you are not an experienced computer user, and you need a reliable guardian to block malicious attacks. Either way, when All_Your_Documents.rar Ransowmare enters the target computer, and user launches the malicious installer, the programs starts working from the same directory right away. It also means that the program may not need to drop different files across your system, and running a single file is enough to launch the encryption process. When that process starts, the program creates new folders and with such titles as All_Your_Documents. As mentioned, these are the supposed .RAR files that keep copies of your encrypted data. The more drives you have on your PC, the more folders this infection will create. Along with the file encryption, All_Your_Documents.rar Ransowmare will also display a ransom note that will tell you how to transfer the payment in order to unlock your files. The program tells you to contact its developers via the given measures, so we cannot be sure how big the ransom fee is, but it is possible to assume that it is at least several hundred US dollars. Needless to say, paying is not an option, and you should never give your money away to these criminals. The best way to deal with this issue is to remove All_Your_Documents.rar Ransowmare right away and then restore your files from a system backup. If you have healthy copies of your files save in an external hard drive or anywhere else, you can easily transfer them back to your PC. However, be sure to do that AFTER you have deleted the infection because the program could infect healthy files again. We have manual removal instructions provided below, but it may not be enough to ensure your system’s safety. Therefore, after manual removal, run a full system scan with the SpyHunter free scanner. If more unwanted files or programs are detected, you will be able to terminate them at once. And your PC will be safeguarded against other threats in the future. Delete suspicious files from your Desktop. Go to the Downloads directory. Remove recently download files from the folder. Delete any suspicious file from the directory. Delete the All Your Files in Archive!.txt document. Empty Recycle Bin and scan your PC. Quick & tested solution for All_Your_Documents.rar Ransowmare removal.